When I'm out and about, I always have my camera with me. It's one of the reasons I like a small, palm-size camera. It fits in my purse and I can whip it out to take a photo of something I know I'm going to want to blog about, assuming I remember why I took the photo when I download it. Vacations provide a lot of inspiration for blog posts. Over the next few posts, I'm going to put up photos of things I saw where I said, "Oh man, that's a blog post." Let's get started. It seems there is a never-ending quest to find the perfect way to dry masses of hands at rest stops across the US. I remember the stacks of used paper towels or dispensed towels from a machine, overflowing onto the floor of the rest stop. You didn't dare put your hand into the garbage can to push the stack down. There could be rotten fruit or a dirty diaper waiting for you. Plus, towels represent paper waste which, at that time, wasn't made from recycled materials. Even though most paper towels in rest stops are made from recycled materials, they represent the end of the recycling stream. It's not feasible to recycle used paper towels. Enter the blow dryer. The best, absolute best, comment I ever read about hand blow dryers was scrawled on one in a rest stop somewhere in my travels. There was a sign on the dryer for how to use it, as well as drawings. If you did a thorough job of washing your hands, as is recommended, there was more water on your hands than the offerings of the dryer could effectively remove. Step 1: Push button to start dryer. Step 2: Place wet hands under dryer vent. Step 3: Move hands around to allow warm air to dry hands. Below this, someone had scrawled, "Step 4: Wipe hands on pants." I'm fairly certain anyone using the dryer got a laugh out of that because it's so true. I hadn't met a warm air hand dryer that really did any kind of reasonable job until this trip. 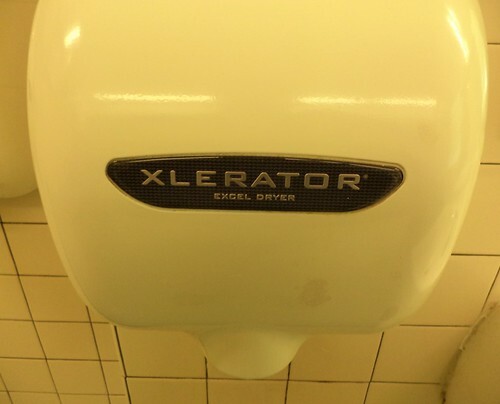 The version shown up above has more power and force than a hand dryer really ought to have. Motion activated, there is a whoosh of air that forces your hands down and blows them dry and I mean dry dry, in about 6 seconds. I didn't even have to wipe them on my pants. They were completely dry. In the winter, you could warm up your feet if you stood close enough. The biggest drawback is that the force of the air coming out is too strong for children to adequately keep their hands in the right position. I saw several girls, under the age of 10, I would guess, whose hands were blown away from the air stream because it's so powerful. They had to stand at the periphery of the circulating air and then wound up wiping their hands on their clothing to complete the drying. I couldn't help think of Tim Taylor from "Home Improvement". "More Power!" It's not necessarily a good thing. And I often wonder if these are any more environmentally friendly than towels. Well, it's only a little electricity, compared to harvesting wood, transporting it, chemicals to break it down into component fibers, reassembling those fibers into towels, warehousing the towels and transportation to the end use, not to mention the cost of landfilling the used towels. There is a cost to electricity we don't remember. What makes that juice? If it's coal, there are mining costs and transportation of the coal to the power plant. There is the disposal of the residue from burning said coal to power the turbines that give you the electricity to run the dryer that will blow your 8 year-old niece backwards 8 feet. Still, in the overall grand scheme of things, these dryers were faster than anything other than wiping your hands on your pants as you walked back to the car. It takes three times as long to dry your hands with paper towels and other dryers just didn't produce enough warm air to be effective unless you were willing to stand there through two or three cycles of air. Six seconds means a lot when you know you have another 5 hours on the road to your final destination. More power indeed.